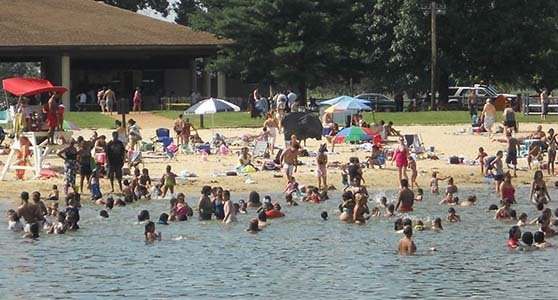 (18/P060) TRENTON – – In the interest of public safety, the New Jersey Department of Environmental Protection reminds visitors to swim only at beaches where lifeguards are on duty, Commissioner Catherine R. McCabe announced today. At least five people have drowned this month in New Jersey waterways due to issues such as exhaustion, riptides and swimming at areas where there were no lifeguards present. With risks at waterways ranging from ponds to the ocean, the public must be extra cautious around all bodies of water, no matter how inviting and refreshing they may appear. There may be unseen hazards such as rip currents in the ocean, a deceptively swift current in a river, or unexpected cold water just below the surface in a lake or pond. These dangers could lead to exhaustion, fatigue or shock, and ultimately result in drowning. Ensure that everyone in the family becomes water competent and learns to swim well, knows limitations, recognizes and avoids water hazards, and understands how to prevent and respond to water emergencies. Swim only at lifeguarded beaches. Use U.S. Coast Guard-approved life jackets when on a boat or in a water situation beyond your skill level. Swim with a partner near a lifeguard’s chair. Obey all instructions and orders from lifeguards, and ask them about local conditions. Pay close attention to children, seniors and new swimmers at the beach. Even in shallow water, wave action can cause anyone to lose her or his footing. Swim sober and know your limitations. Make sure you have enough energy to swim back to shore. Leave the water immediately if a storm approaches. Get off the beach and as far away from the water as possible. Be cautious around natural bodies of water including ocean shorelines, rivers and lakes, even if you will not be swimming. Cold temperatures, currents and underwater hazards can make a fall into these bodies of water dangerous. Wear personal flotation devices when you boat, fish or wade into water with strong currents. Wear protective water suits when you kayak or canoe in areas where cold water may be expected. Protect your neck and don’t dive headfirst. Walk carefully into open water. Watch for and avoid aquatic life. Swimmers should also take extra caution to recognize rip currents, the leading hazard at ocean beaches, and swim only at designated areas with lifeguards. These currents can become more prevalent when strong storms are passing off the Atlantic coast. The National Weather Service issues advisories when rip currents are expected to increase. Rip currents can form in any large open water area and tend to form at low spots and breaks in sandbars, or near structures such as jetties and piers. They are often visible as ribbons of choppy water that flow perpendicular to the beach. 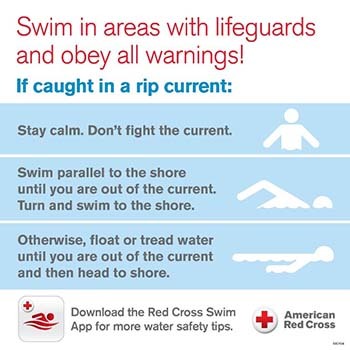 Rip currents pull people away from shore; they do not pull people under the water. Drowning occurs when people pulled offshore are unable to stay afloat and swim to shore due to any combination of fear, panic, exhaustion, or lack of swimming skills. Stay calm and swim parallel to the beach until out of the current. Turn and swim toward shore once you are free of the current. If you can't swim to shore, float or tread water until you are free of the rip current and then head toward shore. Draw attention to yourself by waving and calling for help if you feel you can’t make it to the shore. Get help from a lifeguard if you see someone in trouble in a rip current. If a lifeguard is not available, have someone call 9-1-1. Avoid becoming a victim yourself and throw the swimmer something that floats, such as a lifejacket, cooler, raft, or inflatable ball.